There are many aspects of a deer's anatomy that can help you, as a deer hunter, better know the make up of a deer and how and why deer do what they do. The more you know about how a deer is built the better you will understand there habits and ways of communicating with one another. Understanding there sense of smell, eye sight, hearing and such can give you an advantage when trying to move undetected while hunting the wary whitetail. 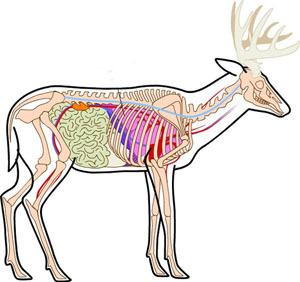 Deer anatomy as it pertains to the location of a deer's vital organs can ensure proper shot placement to despatch a deer quickly and humanely. How and where a deer leave's it's scent is important when using scent lure and cover scents. Even knowing how a deer urinates can help determine what gender of deer you are tracking when in the woods.